For the past 14 months or so I’ve been keeping a journal using the bullet journal method, which I wrote about here and here. During this time, I’ve found using a paper notebook quite fun and effective. I’ve been curious about how these same methods could be used with software on a computer and/or iPad. I’ve considered many apps for this, but none seemed to come close to matching the facility of pen and paper. However, I think I’ve finally found an option that could work very well for me. The following discussion is a bit of a thought experiment on my part, rather than a report on my successful use of TheBrain for bullet journaling. That is, I’ve still only dabbled with TheBrain for this purpose, but I see real promise and wanted to share my thoughts. Before moving into a discussion of how TheBrain would work for this purpose, I should first define what I think are the key attributes of a digital bullet journal? It would need to be accessible from all your devices, to be instantly available for recording and referencing. Recording a log entry should be quick and easy. 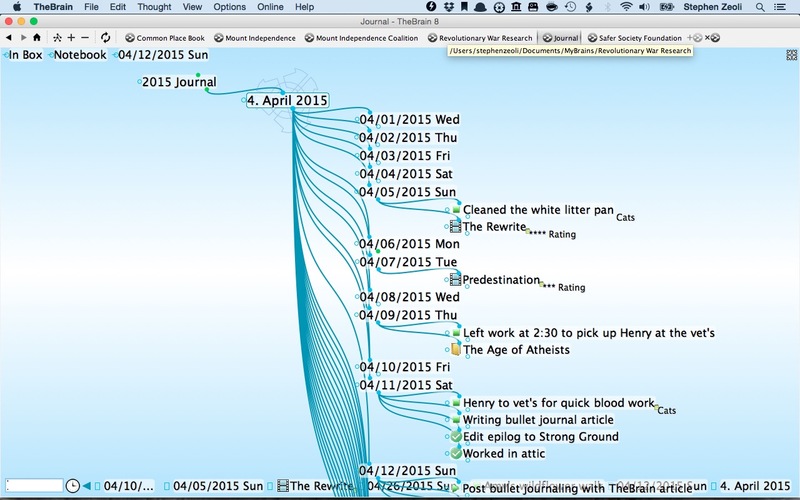 This is the “rapid logging” part of the journal process. It should provide a means for identifying the logged item as a note, event or task. I need to be able to “page” through my entries for quick and easy review. There are many other facilities I might hope for in a digital bullet journal, but these are the ones that are required to match the efficacy of a paper notebook. 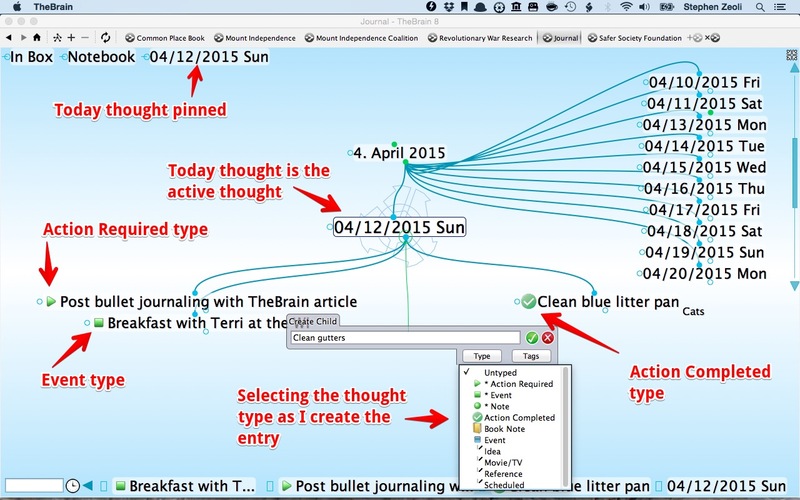 With these criteria established, let’s look at how TheBrain manages with a bullet journal. TheBrain runs on Windows PCs, Macs and iPad, but also provides online access, so that you should have little trouble getting access to your information at any time. On Mac and PC, your files are available locally so you don’t have to be online to use them, but you can sync your bullet journal brain between devices relatively easily (though I do find the syncing a bit stodgie). 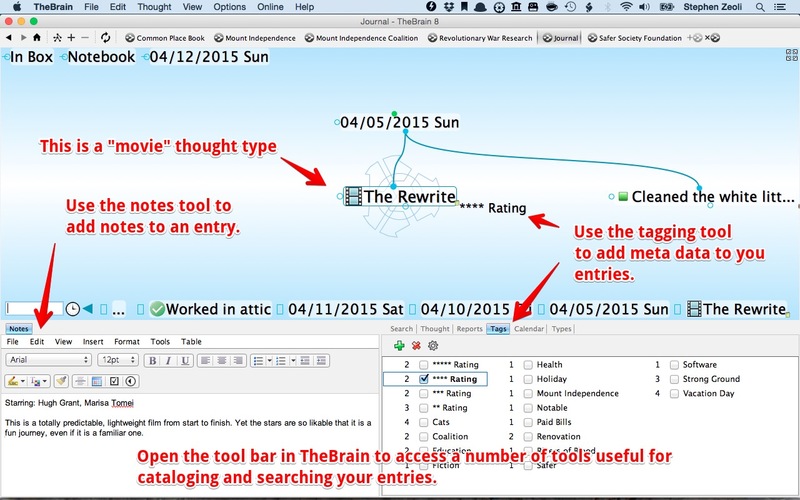 Creating one line entries is relatively easy with TheBrain. Key here is creating a new thought for each entry. 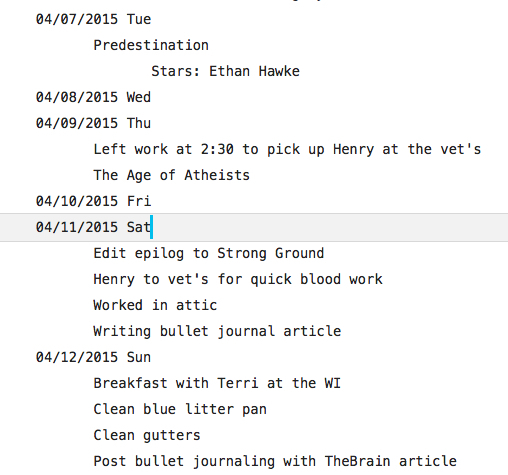 At first I tried creating a thought for each day and using the notes section for the logging of entries. This doesn’t work as well because it makes it more difficult to be able to quickly scan your entries during regular reviews. There are other advantages to one thought = one entry, which I’ll get to below. You can assign “thought types” to your entries to classify them as you wish to. TheBrain supplies a number of ways to categorize your information. 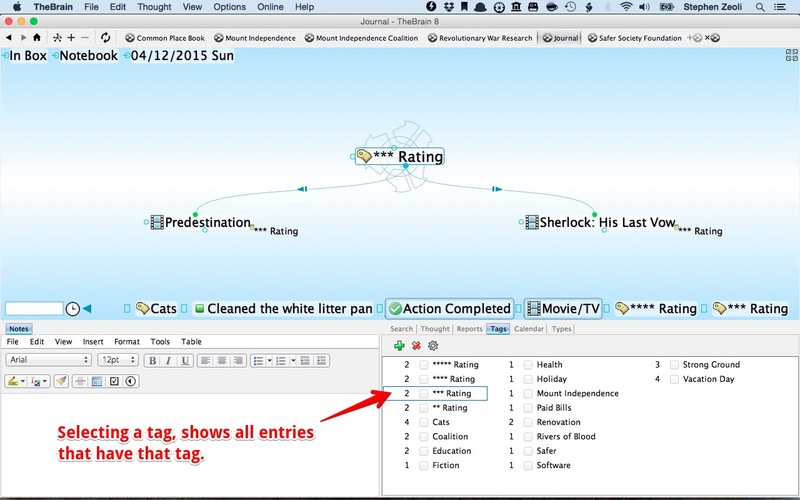 Here I’ve got the tool bar open along the bottom of the screen to access the tag window, among others. 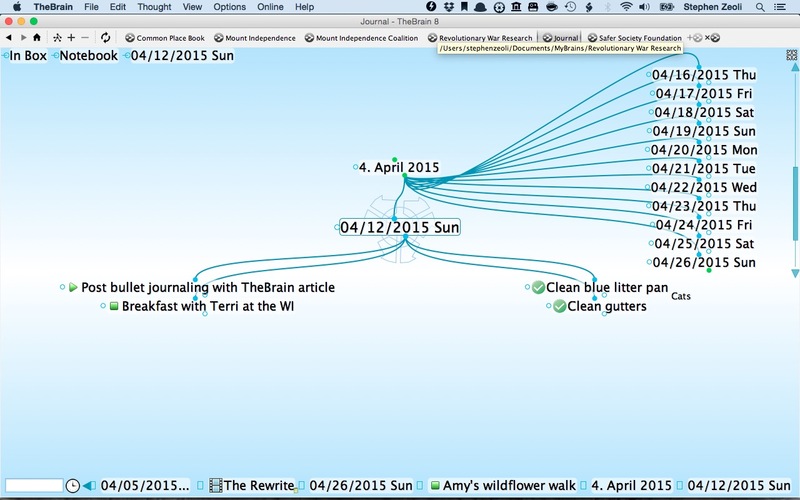 In outline view, TheBrain will show you your entries in a more traditional way. So TheBrain meets all the criteria of a digital bullet journal I set out at the start. Let’s see it in action. First, I built a brain that has a thought for each day using the method I describe here. I make today’s thought the active thought, then add bullet entries under this day, classifying them by type as I make them. I would tag each entry as needed. If an entry needs additional information, I can add that to the notes section, attach a URL or as many files as gets the job done. I pin the current day to the top of the screen to make it a speedy return if I’ve wandered off somewhere else in my journal brain. And that’s it for the basics. But there are other advantages to using TheBrain for this purpose. I have actually created more thought types than the basic three. I have two task types: Action Required and Action Completed. I also have types for book and movie notes. You can make as many types as you want, but I want to keep the number of choices small, as too many options begin to defeat the purpose of rapid logging. You can view all entries with the same tag by selecting that tag in the tags tool (note that you need to click on the description of the tag, not the checkbox). Because a thought can live under more than one parent thought, I can make an entry about the start of something under one day, and link to the same thought on the day I finish. I would do this, say, for tracking my reading. Entries exported to text and pasted into my favorite text editor, Ulysses. You may have noticed that the screenshots above are somewhat sparsely populated with entries. As I mentioned, I have only been dabbling in TheBrain as a bullet journal so far, but writing about it like this has made me a bit more excited by the prospect. If I didn’t really love my paper journal, I would definitely adopt TheBrain whole-heartedly for bullet journaling. And it helps that I rely heavily on TheBrain for other purposes. I’ll report back if things develop further. Steve, was referred to your site today and enjoyed going through your various TheBrain posts. I to have gone through a lengthy journey of outlining and mindmapping tools over the last 30 years, and have settled on TheBrain for my personal knowledge management. Something you would be interested in is our effort to use the Brain as a knowledge management solution for an entire field, indeed one as complicated as climate change. Our Climate Web Brain is at http://www.theclimateweb.com It’s massive, serves many purposes, and we’re constantly experimenting with how to make the information more accessible to very different audiences. FYI, it contains >10,000 documents and more than 15,000 URLs, but more important is how we’re trying to use the unique capabilities of the Brain to link information together in ways that can help provide access to “actionable knowledge” that is specific to an individual user. Unfortunately I can’t edit the post to fix the link. I keep forgetting not to put a period after http://www.theclimateweb.com !!! Thank you for the comment, Mark. I look forward to exploring The Climate Web. (I think I fixed the link in your original comment.) And I may take you up on the offer of a tour when I have some time. I’ve been considering using TheBrain for a similar purpose, though on a far smaller scale. It will help to see how you do it with such an impressive array of knowledge. I just put up a short post about your The Climate Web and TheBrain. Saw a reference to this article in TheBrain Forum; nicely done, am glad to have found your site. Lots of interesting ideas that I need time to digest. I’m a long time user of TB, but I’m not convinced to use it for daily logging or bullet journaling as described. Evernote is my primary depository. For daily notes/journal type, I use the app DayEntry, which accumulates by a consolidated daily note in Evernote. I may use the bullet journaling idea to expand what I save there. Back in 2013, I drew a diagram of the information storage sources that I try to bring together in a retrieval system. http://myknowledgenetwork.blogspot.com/2013/10/my-knowledge-network.html . Still seeking nirvana. An easy connection between Evernote and TB would be a step closer! Can’t help wondering the location of the photo at top of your site — reminds me of Old Speculator in upstate New York. BTW, I am a fan of Mark’s Climate Web. Also find your 36 Spokes site fascinating. I enjoyed looking at your knowledge network. Thanks for sharing. I use Evernote, but not for that kind of journaling. I’ve looked at DayEntry and think that’s a clever solution for combining a number of entries into one EN note, which certainly keeps the clutter down. My problem with Evernote is I just don’t like the user interface. It feels cluttered to me. What I love about TheBrain is how it is constantly drilling down and showing me just the related neighborhood of data. The photo at the top of my Welcome to Sherwood blog is taken from Mount Independence State Historic Site in Orwell, Vermont. The subject in the distance is Mount Defiance in New York State (so you nailed the state). The water between is Lake Champlain. I’m glad you are enjoying 36 Busted Spokes! It was fun putting that together after so many years. Did you end up sticking with TheBrain for your bullet journalling? Which blog entry would that be?